It starts innocently enough, a Dan Lepard Guardian newspaper supplement, a childhood memory of Polish rye bread, one disgusting chilled sandwich too many at a motorway service station, a visit from a beloved Aunt who has always baked her own bread, a day baking with Simon Michaels, another day with Dan Lepard and before I knew it – I was one of them – a full-blown obsessive breadbaker. What do you really need to make bread with? At its most basic, you need time, patience, the willingness to learn, to make mistakes, to think about them, to try again and beyond that – flour, water, salt, something to raise the bread with and somewhere to cook it. But….I read. I read a lot. It’s my preferred way of interacting with the knowledge base of our culture. And the more I read the more I wanted to make other breads: French baguettes, breads with sourdoughs, breads made with alternative sourdoughs, German ryes, American bagels, Irish soda breads, Pasteis de Natas, and inevitably Panettone. One of the frustrations of the internet age is that we have a window on the ‘stuff’ that other people have access to in their own countries; a glimpse at how the export/import market works. The most hilarious example of this being a little piece of kit known strangely as a ‘Danish dough whisk’ which is made in Eastern Europe, but could only be bought in the States (which I ended up doing) or as a very overpriced object in a shop selling American stuff in Bath, England – I could see French lames for sale in Australia and at one point considered buying them there, as Rick at Mairs Bakehouse had done. Something wrong there, no? I wanted German breadforms; I ended up sending cash in an envelope to Herbert Birnbaum who make the best ones, only they don’t take credit cards or Paypal. This is Europe, we’re supposed to be able to trade easily with our neighbours here in England, but because we are not in the Eurozone it all gets so complicated. Is it any wonder that Amazon does so very well? A year ago I found someone selling breadforms on Ebay. I bought some and as there was an ongoing postal strike we had a friendly exchange of emails. Something in the way the seller wrote made me think I had come across him somewhere and I was right; he posted on Dan Lepard’s forum. Ah, I thought, I wonder if he would be interested in finding the things I wanted, the things that people ask for all the time on baking forums, so I gave him a list of things that I desired but couldn’t get here. Bakery Bits has tracked down everything I suggested, and more; from French lames to Panibois, to the Superpeel (designed and manufactured by Gary, without which many a pizza would have fallen on the floor) there’s Backferment and diastatic malt to experiment with too. I have no idea how well my suggestions sell, I hope I didn’t suggest too many duds though. Last Christmas saw an extreme scenario. Lynne and I decided to make panettone, she in Switzerland, me here. We really wanted panettone cases, I know you can make them in coffee cans (American style) and other substitutes, but we wanted them and we wanted the Fiori di Sicilia. A kind soul from Dan’s forum bought panettone cases in America and posted them to me. Lynne ordered Fiori from King Arthur, had it delivered to someone in the States who then sent it over to her office and then finally it came here. What a hoo-ha for something that is made in Italy, another European country. I mentioned this to Bakery Bits. Long conversations ensued about what was so great about homemade panettone and how was it different from stollen and so on. Then I mentioned Fiori di Sicilia and how you couldn’t get it here for love nor money…. I thought BB wasn’t going to buy my arguments, but this morning in the post I got a collection of beautifully labelled bottles with all the Italian baking essences I could wish for and one I hadn’t even heard of before. It looks as if it was a group effort getting these little bottles of joy onto the market; Annalisa Barbieri of the Guardian helped with the Italians and Dan Lepard has endorsed the quality of the essences. Bakery Bits has rebottled and labelled and done all the hard work and so, with my hand on my heart, with no vested interest at all, apart from wanting things too much, so I can bake away here at home – I would just like to say many thanks to Patrick for the conversations over the last year and for all the hard work you put into getting these products into the retail market. I wish you the best of luck and hope your business grows well. You’ve made one home baker very happy in the pursuit of her passion. 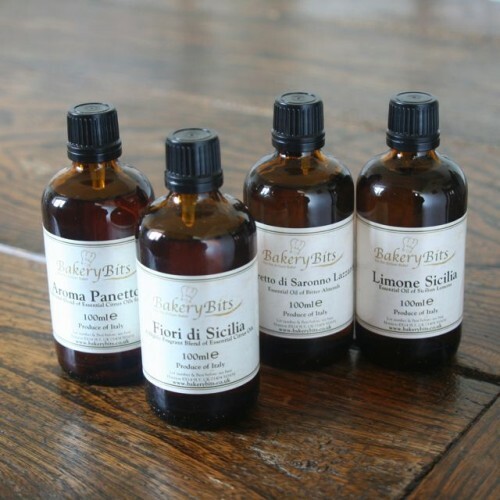 To share the happiness and if you’ve had the patience to read this far down the post, I am offering one bottle of Bakery Bits ‘Fiori di Sicilia’ as a give@away if you leave a comment describing your most obscure object of culinary desire by 22nd October. Dec 2010 Edit: I’ve added a new post since this was written giving links to some excellent Panettone recipes and discussions. This entry was posted in Baking Kit, Bread, Pure Joy and tagged amaretti essence, Backferment, Bakery Bits, Dan Lepard, fiori di sicila, italian baking, limone, panettone, Simon Michaels, Superpeel on 15/10/2010 by Joanna. Wow! I admire your dedication to the cause. Just out of interest, are you a member of the Real Bread Campaign? Hi Sarah. I think we just got lucky that Bakery Bits took this on. I have no entrepreneurial skills whatsoever. I signed up to the RBC the other week just to see what they got up to. I see you work for them. Thanks for commenting. Did you have an obscure object of desire you wished to mention? Please don’t enter me in the contest, as liquids would never make it through the Australian quarantine. * See later comments for good news on this front! But good luck to everyone else! My object of culinary desire? Your Danish dough whisk is very appealing, although again another thing that probably wouldn’t make it into the country because it’s made of wood. Hi Celia, Now I happen to know that a danish dough whisk was dispatched to Australia only the other week from Bakery Bits, he tweeted it…..I thought it might have been you ordering it ? Maybe Bakery Bits should get together with an Australian importer….? How do you get stuff like sloe gin into the country then? I have seen it on your online liquor stores…. Edit: Since I wrote this comment I have been advised that there are some very strict restrictions on what can and can’t be brought into Australia and all imported goods are liable to be checked, fumigated and so on. People ordering over the internet are always recommended to check with their relevant government agencies before ordering goods from other countries outside their immediate trade zones. This goes for ordering from the US into the UK as well, particularly medicines and alternative remedies. Second edit : Aroma Panetonne has now made it to Sydney! Check out Celia’s beautiful festive biscotti recipes. That dough whisk went to me! I have since ordered another one to be sent to my daughter in England.A Danish dough whisk will make it to Australia! To Celia: I live in Perth and have just received mine from Bakery Bits. Love your posts and Zeb’s – I also have a dog and Spot enjoys watching me bake. Spot says Hi back. No, we are very good about not having snacks in the kitchen but he lives in hope! Incidentally, he looks rather like the black and white dog in that cartoon of the dogs on the internet. Ooh! I would say the obscure object of my desire now that I’m back from Italy is… sfogliatelle! Could not believe how good they were, even in cafés in the Naples airport. I may have to make them cos I would be surprised if they exist in Cambridge. I have no idea whether anyone does; have you tried? Am about to put out a Twitter appeal for guidance. Yes, that’s them! The very thin layers are crisp and shatter beautifully when you bite into them, and, well, anything filled with sweet ricotta is worth eating; at least I think so :). Definitely try one. I’m sure the limone essence would be very nice indeed. Visiting Gloucester tomorrow Robin! Dog clipping again. Meeting up with Gill the Painter at the Cathedral :) Maybe we’ll do an exploratory mission to the italian cafe too…. For the ‘Crucible ‘ exhibition? There are some good pieces in the show – I think my favorite is the Paolozzi ‘Vulcan’ by the south door. That’s a great exhibition Robin! I’ve never been in the Cathedral before, despite all my visits to Gloucester over the last year. It must be very quiet without all those bodies lying around everywhere. Not sure about the hands in the wall thing. I also got a feeling that I had strayed into a Dr Who set from time to time. That cafe didn’t have the sfogliatelli :( they had canoli, I told the lovely owner that I expected sfolgiatelli next time I came and he waved his hands and said he would like to have them there too, Gill and I thought there is an opportunity for someone…..
Panattones look fantastic,well done, a marvellous achievement, I’d say during the Christmas season we must go through 2 a week, I buy mine fresh, it’s a real competition between bakeries here in Italy, and I fill mine with custard and cover in chocolate gananche every Christmas for a special treat for all the family. As for the tin covers just let me know, I’ll send some over to you! Sfoliatelle another sweet desire in my home! Well done ! I just visited your blog Yvette, what wonderful pictures you take! I see you live in Italy, presumably you can get Fiori di Sicilia in the shops there? What are the tin covers you mean, I’m intrigued. Do you mean the panettone papers? Bakery Bits is doing those too now I think. Is there something English or Australian that you crave, living so far from home? I love your persistence, Joanna. I give up if I can’t find something and try to substitute local ingredients. Plus, I hate shopping and am not real internet proficient. I think those essences would fit into the category of, would love to have, for me. Or the Danish pastry hook. I have the patience, willingness to learn, the ability to make mistakes and learn from them, the flour, the yeast/sourdough/leavening part – just lack most of the fancy forms and equipment. I like your boule for raising as well. I’m just really impressed that you have influenced a retailer in what to offer! I substitute all the time, particularly the flour, but some things you just get curious about and want to see what they are….. I love my dough whisk and am so glad you got one. The super peel is next on my want list, but I’ve been waffling . . . it’s good to learn that you enjoy yours! Maybe I’ll cave and order one. Hi Abby! So much fun but quite hard work too! We skewered the bottoms of the paper cases with two meat skewers and suspended them on broom handles balanced on the backs of chairs. Now that’s a funny story, unfortunately one that many a home baker (including myself) has come across at any given point in their home baking life. Hola Ibán! Thanks for commenting. You make me feel I’m not alone in my obsessions. I see on your blog that the Handmade Loaf is translated into Spanish! Edited: Didn’t realise you translated it :) WOW! Just read Jeremy’s interview here! Well, I don’t know if it can be termed “obscure” but just yesterday I ordered what here in the US is known as a Wondermill – a grain grinder. Of course, every baker eases into the craft without the use of such a tool, and maybe like me, only harbors a buried wish to someday know just how much better one’s loaves might be if made with freshly ground flour. Recently, I looked at my mad money account on PayPal – where my meager monthly web writing earnings accumulate – and noticed that amazingly there was enough to actually buy a Wondermill. It was like fate was speaking softly in my ear – and I always answer Yes when fate speaks softly in my ear! BTW, that sfogliatelle pictured above is perhaps the most amazingly delicious thing I’ve ever eaten out of my hand – sadly, I’ve only had one opportunity to experience one -at an Italian food festival in Seattle- I think it’s a pretty rare treat over here as well, but I live in hope. I’m hoping that we’ll get some sfogliatelle recipes from somewhere too! Last year I was almost mad enough to set aside an area of our allotment and attempt to grow some grain to mill. I was discouraged by a few things: finding the right seed grain, getting enough sun to get the moisture levels down to the right level (I seem to remember from working in a grain mill many years ago it had be about 14%); and how I would tell when the grain was ready to mill. Go on Robin, grow some grain! I think that’s a wonderful idea ! A rye field (and perhaps some ergot on it for a cheap thrill…). Mixed woodland eh? To provide fuel for your wood-fired bread oven? Joanna I think I was smiling through your whole post. I love your dedication, precision and enthusiasm. Unmatched my lady. Seriously makes my hack attempts at bread to shame. Now Panettone….with my hand on my heart, I can tell you I love nothing better in the world. Having spent quite a bit of time in Italy when I was younger, I’ve eaten a lot and they are allll delicious. My delightful italian friend hauled a panettone to Australia about 12 years ago, only to discover that we had them here too. (But it was well appreciated.) I made one once with my mum about 16 years ago, but not since. I think I need to make some this Christmas, which means I’m going to be on the hunt for panettone cases….and I’m still after a small round spiral banetton. Hi Brydie, thank you for the lovely compliments; coming from the seven footed starfish maker – now that takes precision ! I’d have to go searching for the panettone recipe, see if I can dig it out. *ahem* small very excited cough…bought my spiral banetton and just got the email to say its been shipped. So excited about this, its ridiculous! Hi Joanna, well done for getting Bakery Bits to collaborate with your advice and expertise! They are certainly useful. My obscure object of desire would be to have a village bakery/oven. I had a lovely German student stay with me, and she told me that the grandmothers in her village do all the baking in a communal small oven for the families. I was encouraging her to learn their skills, and she sent me some photos. One of the buckets yes! of risen dough, which look like they are being scooped straight into the oven, and another of the loaves in the oven! I was looking for panettone cases too, shame they are so hard to find over here. Your breads are gorgeous, I’m glad I found your blog – I feel the need to make some bread again! Hi Nic, what a beautiful blog you have! Patrick at Bakery Bits has the panettone cases too this year in various sizes and small quantities. The only one he doesn’t have is the Easter Columba dove one. An even obscurer object of desire, that and the pandoro tins, no one has those in small quantities. The problem is that they come commercially in packs of 600 or more. I know because I asked last year! The other place that had panettone cases last year was a company called Greenearth packaging – they put a few lots on ebay and you find them there sometimes. I don’t know if they are doing the same this year, if you wanted to compare costs and so on. What a wonderful post! I’ve been slack lately with reading other people’s posts – busy at work and so forth, but I remember looking at the panettone when you first posted them and thinking just how amazing they look – especially with their lovely cases. I’m always so amazed at the range of breads you bake. I was going to say that my obscure object of desire was a brotform, and more specifically a small brotform – I tend to make smaller loaves when I can so that I don’t have to munch through the same flavour for weeks at a time and can ring the changes but I hadn’t seen any. You’ve solved my problem though and I think my family will love you too as you’ve just solved their Christmas present problem. So I guess I don’t have an obscure object of desire now because it isn’t obscure! Keep up the inspirational and informative posts, I love reading them! Will put your names into a hat tomorrow. Thanks for commenting everyone! The winner, as selected by Zeb on Saturday morning, was DocFugawe!